Hello once again Eyes On The Ring Faithful. It’s another week and I am here with yet another review of Ring Of Honor Wrestling Television. This show was decent and full of plenty of set up for ROH’s 13th Anniversary show in Las Vegas, Nevada (which I will be attending live), so lets get down to it. This week’s show opened with a promo from Jay Lethal, the reigning and defending ROH World Television Champion, talking about what was taking place tonight. He made mention of both ACH and Matt Sydal, whom of which are his opponents as he defends his ROH World TV Title in a triple threat match in the main event. From there, we go to Kevin Kelly and Steve Corino who are positioned at ringside to call all the action for the evening. Out first is the Romantic Touch, who saunters down to the ring. He has a rose in his hand and uses it as an air guitar to play along to the beat of his theme song. From there, we go into the first match of the night. Result: Moose defeats The Romantic Touch via pinfall after a flipping spear. Thoughts: The match started out with the Code of Honor, right as the bell rings. The two men feel each other out with neither man doing anything of value for the first few minutes of the match. The first big move of the match came when Moose picked up Romantic Touch by the throat with both hands and hoisted him across the ring. Later on in the match Moose went for some sort of move and messed it up due to the timing of it being off. It could have been either guys fault and to be honest I’m not sure exactly what the move was because it was hard to tell what they were trying to accomplish in the first place. Stokely Hathaway (Moose’s manager) tries to interfere on the outside, but Touch kicks him and takes him out of the equation. The finish came when Moose runs across the ring and hits The Romantic Touch with a flipping spear. I don’t understand why Moose feels the need to do a flip with a spear but whatever, he got the win either way. There wasn’t much to this match. But it was entertaining (due to Touch’s shenanigans). Back from commercial and The Decade (Jimmy Jacobs, BJ Whitmer, and Adam Page) make their way out to the ring and Jacobs grabs the mic. Jacobs talks about how guys like Kevin Steen left Ring of Honor high and dry and he doesn’t approve of it. He also takes exception to the opinion that guys like Alberto El Patron come in and out as they please when he (Jacobs) has been there since day one. Jimmy then goes on to say that the Decade has ditched Roderick Strong and that Adam Page is no longer a “Young Boy” and for this reason they need to find another “Young Boy.” This brings out Chris Laruso, who wants to fill the role. Result: The Decade defeat the three jobbers via pinfall after Adam Page hits one of them with a back to belly piledriver. Thoughts: There wasn’t much to this match. It started out and Adam Page came in and kicked one of the unknowns in the face. This was pretty much a showing of what the three members of the Decade could do because the guys they faced didn’t get much offense in. The finish to the match came when Adam Page hit one of the jobbers with a back to belly piledriver to score the pinfall and get the victory in a match that was never really in question at all. One thing to mention is that during the match BJ Whitmer got into an argument with Steve Corino. I know that Corino often plays up the fact that he doesn’t like Whitmer when he’s on commentary. But, sometimes I wonder if this is part of the show or if there is some legit heat between them. Up next, we get a promo from The Briscoes hyping a six person mixed tag match for next week as The Briscoes team with ODB to take on Matt Taven, Michael Bennett and Maria Kanellis. Thoughts: This year’s tournament has been very hit and miss for me. But this one was very much a hit. I hadn’t seen anything from Ashley Sixx prior to this match but Dalton Castle is Ashley Remmington in Chikara (which is probably the reason why he isn’t going by Ashley Remmington in ROH--plus he faced a guy named Ashley in this match) so I know what kind of a worker he is. First of all Dalton Castle’s entrance is absolutely ridiculous. To start things off the two men go for the Code of Honor. However, Sixx bites Castle’s hand as the match starts. Castle hits a splash on the ground for a near fall, from there and after Sixx recovers he hits a northern lights suplex for another near fall. Ashley Sixx takes over and hits Castle with a sick lariat for a near fall. From there two men in masks make their presence felt at ringside meanwhile back in the ring Ashley Sixx hits a topei to the outside. Back in the ring, Ashley Sixx grabs Dalton Castle and delivers the Sixx Year Itch (Sitout Chokeslam) to score the pinfall victory and advance to the next round in the top prospect tournament. After the match Adam Cole makes his way to the ring he grabs a microphone and then puts it down and goes to get a chair. Adam Cole brings the chair into the ring and unfolds it, he then sits down and extends the microphone to his mouth. However he drops the microphone and then flips off the crowd before heading back up the ramp. Have no idea where this is going, but I’m intrigued. Result: Jay Lethal defeats Matt Sydal and ACH after hitting ACH with the Lethal Injection to retain the ROH World Television Title. Thoughts: Jay Lethal is introduced as “The greatest first generation wrestler of all time.” The match starts out with all three men in the ring, ACH and Matt Sydal join forces to throw Jay Lethal out of the ring in order to take him out of the match. ACH and Sydal go at it for a few minutes all while trying to make sure that Lethal can’t be a factor. Once Lethal finally gets in the ring, ACH and Matt Sydal make their way to the outside of the ring. From there Lethal capitalizes with Sydal on one side of the ring and ACH on the other as he delivers two suicide dives the first on to Sydal and the first on to ACH. ACH recovers and gets back into the ring and starts getting into it with Lethal once again which brings Sydal back in but it’s short lived as he immediately gets thrown out as to keep it one on one. Sydal gets back in, but ACH jumps off of the top rope and drives both his feet into the back of Sydal’s neck for a near fall. Sydal rolls to the outside of the ring and Lethal follows him ACH takes another high risk and jumps off of the top turnbuckle taking out both men. Back in the ring and Matt Sydal hits a shooting star press on ACH for a near fall. The finish would come when Jay Lethal hits ACH with the Lethal Injection to get the pinfall victory and retain the championship all while Sydal is on the outside of the ring. After the match, Alberto El Patron comes out after Jay Lethal and chases him to the back of the building. El Patron then goes back inside of the ring and stands tall celebrating with ACH as the show goes off of the air for the week. And that’ll do it for me and this review of Ring Of Honor wrestling television. I wasn’t a huge fan of having four matches this week but they managed it well and each match got a decent amount of time but I prefer a three match format to the one we had this week. If you have the time this week I would recommend checking out the main event as it more than delivered. We also had some good storyline progression towards the 13th anniversary show especially with the ending of having El Patron chase off Jay Lethal who he will face for the TV Title at The 13th anniversary. So until next week Eyes On The Ring readers I am Nathan saying so long for now and be sure to keep your Eyes On The Ring for all of the great content that we promise to bring you in the upcoming weeks, month’s, and years. Be sure and follow Eyes On The Ring on twitter @EyesOnTheRing as well as myself @Headliner5. Last but not least check out EyesOnTheRing.blogspot.com for more reviews from myself and articles from the rest of the EOTR team. 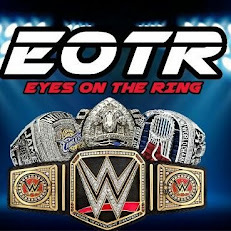 Also be sure to check out blogtalkradio.com/ElitePodcastNetwork for Eyes On The Ring’s weekly radio show which drops every Sunday night as we bring it to you live at 11:00pm eastern time. Last but not least like us on Facebook at Facebook.com/EyesOnTheRing and keep your Eyes On The Ring!